I thought I could fit it all in one final post, but that proved to be a mighty miscalculation. I had far too much to say about the Outlander tour alone–big surprise!–and I still plan to provide an overall series wrap-up. In fact, this post is so substantial, with pictures and tons of Outlander-related resources, I thought it best to include a table of contents. Get ready for everything (else) you need to know to create the best Outlander adventure for you and yours! The final post is forthcoming. If you missed any of the first 4 parts of the series An Outlander Tourist in Scotland, you can find them in my blog’s Scotland and Outlander sections, linked through Scotland Ventured, Scotland Gained, or in direct links to Part 1, Part 2, Part 3, and Part 4. The first 3 parts showcase 37 filming & book locations with several photos. Part 4 details my trip planning process with snapshots of our planned vs. actual itineraries and reflections on the quality of our Scotland vacation experience. This post, a.k.a. part 5, includes a succinct list of 40 Outlander filming sites. Read on for more! I started my tour search by perusing Diana Gabaldon’s recommended Outlander tour companies, discussed on her website. I sought a company that offered tours of more than half a day but less than 3 days so we could balance official Outlander tourism with exploring Scotland more generally. My first choice was Inverness Tours, but by the time the dates of our trip became settled, there were no tours of the right length available among those led by their four tour guides who work year round. Inverness Tours has long been a popular tour company with Outlander fans. Moving on to Slainte Scotland, I contacted the company through both email and their website’s chat feature to get details about their 1-day Outlander tour. After a few messages back and forth, and a chat with a very helpful representative, I learned the likelihood of visiting West Kirk (the Black Kirk) in Culross and the all-important Midhope Castle (Lallybroch), and I carefully parsed the schedule of stops to ensure we’d have time to make it to our 7:30pm play showing in Edinburgh that evening. Satisfied with all the circumstances, I decided to take the plunge and booked our tickets for the tour. Slainte Scotland made a great first impression by being prompt, informative, enthusiastic, and professional in their communications. They provided the detail needed to help make our day flow as smoothly as possible. The day started on our own with a train ride from Edinburgh to Dalmeny Station, our meeting place for the start of the tour. Slainte Scotland day tours allow travellers from both Glasgow and Edinburgh to converge on a central location for sites in the wider area. Dalmeny is located in South Queensferry, a stone’s throw from the Firth of Forth, about 20 minutes by train northward from Edinburgh’s Waverley Station in the valley opposite the Princes Street Gardens between Old Town (south) and New Town (north). in the well-preserved 17th-century style Royal Burgh of Culross, used for Crainsmuir village, Geillis Duncan’s house, and the Castle Leoch herb garden. Each site’s inherent charms, curiosities, and historical intrigues await your discovery. Midhope Castle, the exteriors and grounds of which served as the site of the Fraser home of Broch Tuarach, or “north-facing tower” in Gaelic, is known affectionately by those who call it home in the series as Lallybroch. The building itself is hazardous to enter, so the entrance is locked to visitors. The interiors of Lallybroch were constructed and filmed at LBP Outlander, Ltd., the Outlander studios at Wardpark North in Cumbernauld, to the east outside Glasgow. Visitors may be surprised to find a couple of houses in close proximity to the building, but you might enjoy reading a bit on the way to the castle about the history of the family that used to live in and now cares for the estate. When we visited, it was the last day of public access before a solid month of filming for Outlander series 3 two days later. Preparations were in evidence with the plastic tarp and orange cones covering the threshold, along with equipment set up beside the castle. Note the electric poles and wires they have to edit out of final shots. Jamie’s ep102 flashback to BJR’s visit to the estate, where it starts on the hill as Jamie sorts the hay, and Jamie’s ep113 confrontation with Tarran McQuarrie’s lackeys of the Watch in the Lallybroch stables were filmed behind the castle and up the hill at this location. Blackness Castle was one of my favorite attractions in all of Scotland, not just from the Outlander tour. As our tour guide Catriona explained, “Blackness” describes not the mood of the castle but the color of a specific type of land form on which the castle was built, called a “ness,” meaning a “promontory; a cape or headland” (https://glosbe.com/en/gd/ness). With the sun shining down on it, the tide out stranding a smattering of sail and fishing boats, and a view across the shore and the firth, our time at Blackness Castle was nothing but bright and cheerful. Said to be haunted, the prisoners’ tower I left to my husband’s exploration–I didn’t want to climb all those steps. Our guide Catriona (pictured) showed us where the platform staging Jamie’s flogging by Captain Randall was set up. It was interesting to see how much uplifted rock protruded into the floor of the courtyard of this very intact, ship-shaped castle. There was much to explore and there were hazards to avoid as we climbed in and out of the corridors and doorways, down steep steps and along the terraces framing the top level. Catriona also showed us the location where Jamie and Murtagh question the English soldier rather rudely as to the whereabouts of the “Englishwoman,” Claire. Royal Burgh of Falkland, a National Trust Scotland site, offered a little eerie magic at the Bruce Fountain in the town center. Here in ep101, we see the back of Ghost Jamie watching night-gowned Claire through the second-floor window of Mrs. Baird’s B&B as she brushes the tangles out of her hair. Moments later, Frank walks up to him in the rain, and he disappears. I couldn’t resist a little mimicry of the scene. The lunch at the Covenanter Hotel was simple but acceptable (I had tomato soup and a tuna sandwich), although service was a little slow. They were not particularly expecting us and seemed to accommodate us but grudgingly, based on the comments of our tour guide at the time. This delay may have contributed in part to our skipping West Kirk as the final stop in the tour. Falkland Palace was visible across the main street from the hotel, and on the opposite end of the town square was the furniture store that served Claire’s window shopping of vases in ep101. Our guide Catriona had the opportunity to be an extra background actor in series 1 and described the freezing cold conditions of working on set that day. We walked a bit through town on our way back to where they had parked the vans after dropping us off in the center of town. The sunshine enhanced our enjoyment as we passed a tavern where Catriona pointed out a sign outside that Àdhamh Ò Broin had told her misspells a Gaelic word, comically altering the translation from “a thousand welcomes” (ceud mile failte) to “a thousand smells” (ceud mile faile). Whether the proprietors were Scots, English, or other, it proved that even the locals lose themselves in translation sometimes. Doune Castle first became widely known overseas from its use in the film Monty Python and the Holy Grail. Now, complimentary audio guides at the castle impart insights about filming experiences from both Terry Jones of Monty Python and Sam Heughan, who plays Outlander‘s Jamie Fraser. Castle Leoch’s great hall and some other interiors found form on constructed sets at the studios, but the raw materials at Doune provided the courtyard, steps from the castle, exterior shots of the castle, and scans of the surrounding countryside. Monty Python used the interiors heavily for Holy Grail. Another well-preserved structure, Doune Castle was an impressive element of the tour. At the close of our Doune visit, Slainte Scotland provided samples of 15-year-old Dalwhinnie (Highland) single-malt Scotch whisky. A little fiery going down, but still smooth and a good introductory single malt, Dalwhinnie became one of two whiskies my husband and I took home with us from duty free. An unusual aspect of our tour that day was the presence of the tour guides’ three children and their German shepherd puppy (pictured in the Falkland section above). Their arrival in Dalmeny was slightly delayed due to complications in the aftermath of unavailable daycare. The kids were well behaved and charming. One spoke Gaelic from attending a Gaelic school and also sang us a song. It was equally delightful to meet and chat with our fellow Outlander tourists from England, Kentucky, and Germany. While our van held two of the the three kids and Catriona, the other was driven by her husband with the puppy and the other American group as passengers. While we tasted our whisky, the kids were off running, inducing the dog to whine so as to join in the fun. Overall, from our point of view, the impromptu adjustment worked out well. I’m sure it helped that we love dogs and are perfectly contented with good kids around. Royal Burgh of Culross. At the witching hour before sunset, we arrived in old Culross, National Trust Scotland site of series filming for exteriors of Crainsmuir village. We drove past the distinctive yellow buildings of the Palace into the square of the mercat cross where the exterior of Geillis Duncan’s house and the pillory were filmed. We stayed only briefly, and driving was particularly tricky in the narrow streets of this well-preserved old village. Cars kept coming down a hill into the village square, forcing our van to back up a couple of different times before successfully making it all the way up the hill. Such is life in old towns with one-track, or one-lane, streets that go both ways. For Outlander series 1 filming, the Culross Palace Garden doubled as the Castle Leoch herb garden, the Mercat Cross stood in for the village of Cranesmuir, and visual effects fused the Palace Garden with the backdrop of Doune Castle to bring Crainsmuir and Leoch together. The Study building (in white) was Geillis Duncan’s house, and the Culross Palace Withdrawing Room became Geillis’ drawing room. In series 2, the Palace Courtyard provided the main stair where Claire practices dentistry while Jamie meets with Bonnie Prince Charlie, while the Palace High Hall was used for the Jacobite meeting where Jamie swears his oath to the Prince. Then, the Palace’s Kings Room became Jamie and Claire’s bedroom when visiting a village, and the Palace’s Kitchen and Pantry served as the tavern bearing wanted posters, and the Bennet House outside it, in ep211, “Vengeance Is Mine.” See where Jamie & Claire stood: http://www.nts.org.uk/Outlander/Culross-Palace/. Although I had hoped we would venture nearby to West Kirk (the Black Kirk), time constraints and fading daylight robbed us of the chance, so we worked our way southward again, back across the Firth of Forth, to Dalmeny, South Queensferry, to catch the train back to Edinburgh’s Waverley Station. On our way back to Dalmeny, Catriona played a mix of songs by Scottish artists, old and new, which added to the festive mood. I took a final opportunity to ask Catriona about Hopetoun House, the estate of which we passed on our return path. She provided the insight that a visit there would require at least 2 hours, whereas one could take in all of Linlithgow Palace in about an hour. These details helped us make decisions about where to go in our trip’s final days. This exciting 9-hour tour with Slainte Scotland was led by Owner and Managing Director of Clyde Coast Tourism Ltd., proud Scot, and Outlander STARZ TV series extra–the lively, lovely, and knowledgeable pro tour guide Catriona Stevenson. Assisted by her husband and fellow driver, the small group experience allowed time and attention for individual questions and interests. Although the tour path altered slightly from the order of advertisement, in the end we had no regrets. The sun was setting as we alighted on the train platform in Dalmeny. That evening at the Royal Lyceum Theatre, Edinburgh, we attended a vibrant performance by the Dundee Rep Theatre of a 20th-century, ceilidh-style historical and political play The Cheviot, the Stag, and the Black, Black Oil, which kept us awake even after an all-day tour and with jet lag setting in from the day before. Seeing this play early in the trip provided essential perspective on the past 200 years of Scottish-English relations and politics, which we could then reflect on as we traveled the country. * One particular Outlander visit I arranged directly with the property manager, Sarah Chambers, was to Glencorse Old Kirk, location of Claire and Jamie’s wedding in ep107. Through email and then mobile texting upon arrival on the grounds, we settled on a day and time, around 2:45pm on 21 September, for a brief look through and around the kirk. We were staying in Arrochar at the time and had just visited the incomparable Stirling Castle that morning. Sarah asked in advance for a donation of 20 pounds, which we gladly provided, and she showed us a scrapbook of filming pictures not seen online. She also pointed out how the grounds and interior were used in the making of ep107, sharing her personal observations of the occasion. Many visitors and some journalists have mistaken the Glencorse House for the Glencorse Parish Church as the building used for the wedding. The actual site is downhill and behind a gate from the house. It’s a little hidden and difficult to find, even with assistance, and it requires permission to access. But if you’re all about the wedding, Glencorse a great little addition to an itinerary. Incidentally, they also regularly host weddings at the church and receptions at the house. See the Glencorse House facebook page for a flavor of their work. Directions from Edinburgh: Take A701 toward Penicuik. After you pass the Ikea, continue past the Nissan garage at the traffic lights. Then, there are 2 roundabouts till Gowkleymoss roundabout (very large). Continue on the small dual carriageway w/ Glencorse Golf Club on left, then very shortly Fisher’s Tryst pub on the left. Directly opposite the pub, take the road to the right signposted Glencorse Kirk. The large church on the brow of the hill is NOT us. Continue round the corner, to the bottom of the hill: you’ve arrived! Total of about 2 miles from Ikea. The property is owned by the McCaig family, and our contact was Sarah Chambers (McCaig), daughter of the owners. Glencorse Old Parish Church, or Glencorse Old Kirk, is located in the foothills of the Pentland Hills south of Edinburgh and north of Penicuik, Midlothian. The address is the town of Milton Bridge, EH26 0NZ. Tel: 01968 676 406. Email: info@glencorsehouse.com. Glencorse House: http://www.glencorsehouse.co.uk/. After our visit at Glencorse, we enjoyed exploring the iconic Rosslyn Chapel in nearby Roslin, site of key scenes in the filming of The Da Vinci Code. Slainte Scotland offers several different kinds of their most popular day tours including the Loch Lomond and Trossachs Day Tour, Whisky Distillery Tour, Glencoe Day Tour, Loch Ness Day Tour, South of Edinburgh Tour, and a selection of Outlander Day Tours. However, they are open to interests in other destinations, and some tours can be personalized. Their website’s site map also has sections for Whisky Tours, a Luxury Tour, a Private Tour, Cruise Ship Shore Excursions, and a tour search page. On TripAdvisor, the management company for Slainte Scotland, called Clyde Coast Tourism Ltd., features over 100 reviews with an average rating of 4.5 out of 5 stars, and has earned TripAdvisor’s Certificate of Excellence, awarded to attractions that consistently receive great reviews from travelers. Visit http://slaintescotland.com/ and http://slaintescotland.com/day-tours.html for more information. Outlander Day Tours at http://slaintescotland.com/outlander-tours-of-scotland.html describes the packages for the Outlander Day Trip, Outlander 3 Day Tour, Outlander 7 Day Tour, and Outlander 5 Day Tour. In addition, a new offering from Slainte Scotland this year is a special Outlander tour featuring actor Scott Kyle (Outlander‘s Ross) and supporting Highlander actors from the show, as well as Outlander‘s Gaelic Consultant Àdhamh Ò Broin, Fraser Murdoch who works on Outlander‘s visual effects, and Gillebride MacMillan who plays Gwyllyn the Bard in series 1. The tour will launch from the 2017 Starfury Convention in Blackpool, England, at which Sam Heughan will appear on Saturday and Sunday. The subsequent Outlander Tour with Special Guests is scheduled for 28th August to 1st September. Outlander-Based Tours of Scotland – DianaGabaldon.com – Herself explains the purpose of her list, provides disclaimers, and describes how the selected companies made the list. Slainte Scotland – Outlander Tours | VisitScotland – Are you a fan of Diana Gabaldon’s Outlander books and the subsequent hit Starz TV show of the same name? Do you want to enjoy the landscape that inspired the books? Join us on our Outlander Tour, visiting some of the main filming locations. Outlander Day Tours from Edinburgh and Glasgow – Scottish Tours and Private Hire – Slainte Scotland Tours – Outlander Day Tours from Edinburgh and Glasgow. Includes Castle Leoch and Fort William. Outlander Tours, Outlander filming location Tour, Outlander Tour Scotland – Scottish Tours and Private Hire – Slainte Scotland Tours – Outlander Tours of Scotland. Be your own Claire Randall searching for your very own Jamie Fraser. Clans & Castles (clansandcastles.com/gabaldon.htm) – Clans & Castles – self-guided itinerary for fans of Diana Gabaldon ‘s novels – Clans & Castles itinerary for fans of Diana Gabaldon’s novels. Will you walk through the split stone? Borders Journeys (bordersjourneys.co.uk) – Outlander – Preston Mill – Outlander Film Set – Borders Journeys – Tailor made private guided sightseeing and ancestral tours of Scotland. Specialising in Dumfries & Galloway and Scottish Borders. Outlander tour – Rosalyn’s Ancestral & Outlander Tour – Borders Journeys. Outlander Road Trip – Borders Journeys. Borders Journeys has also taken tourists to Glencorse Old Kirk, among other southern and central filming locations. I checked out at least four other companies online last summer, but there are probably dozens. One of those four was Vacation Scotland, included in Diana’s list. Her description was compelling, but I was put off by their outdated website presentation and place name misspellings. Further perusing signaled to me a company I wouldn’t personally pursue. Although I didn’t include them here, you may find expertise and other facets that make up for the shaky first impression. Another company steered me away by their emphasis on Ireland tours. I recommend finding a company that has specialized in Outlander tours for several years prior to the show’s premier and those that have a genuine special interest in the series, a unique approach, or a special focus. They’re more likely to deliver a bit of the magic viewers and readers receive from the series. For instance, it was very interesting to me to hear about Catriona’s acting and running into the cast on more than one occasion. She also knows Àdhamh Ò Broin, official Gaelic language consultant for the show, with whom we explored Argyll on 20 September, three days after our Outlander tour. For other tour possibilities, go to Outlander Tour Search Results – VisitScotland. Outlander – Filming Locations in Scotland | VisitScotland – includes a link to their pdf (below) with labeled map and site snippets, a section on Outlander book sites including Inverness, highlights of Outlander-related culture and history, and links to other TV, film, and literary tourism opportunities. Outlander’s Cast and Crew’s Favorite Filming Locations | Travel + Leisure (interview, 2016) – The masterminds behind the Starz hit spoke to T+L the best places they went on the job. Outlander – Preston Mill’s Outlander | National Trust for Scotland USA (ntsusa.org detailed article about the scene) – In June 2014, 150 cast and crew members from the hit TV show Outlander set up camp at the NTS Property Preston Mill and Phantassie Doocot. Outlander – Preston Mill – Outlander Film Set – Borders Journeys – Tailor made private guided sightseeing and ancestral tours of Scotland. Specialising in Dumfries & Galloway and Scottish Borders. Outlander – Cairngorms – Tulloch Ghru (as Featured in Outlander TV Series) | Stately Home (lovetoescape.com) – Tulloch Ghru (as Featured in Outlander Tv Series) is a Thing to Do in Aviemore, The Highlands, Scotland. Stately Home, Loch, Lake, Waterfall, Nature Reserve, Park, Garden or Woodland . . .
Rothiemurchus Forest landscape profile/description. 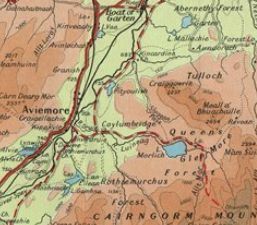 This area of the Cairngorms National Park is located in its western region on an east-west line between Fort Augustus (at the southern tip of Loch Ness) and Aberdeen (on the North Sea coast). Fowlis Wester Sculptured Stone, Perthshire (Perth and Kinross) – In village church at Fowlis Wester, 6 miles (10km) NE of Crieff, On the A85. Historic Scotland property; tall cross-slab carved with Pictish symbols, figure sculpture and Celtic details. Nether Largie Cairns, Argyll and Bute – Between Nether Largie and Kilmartin, Argyll, Off the A816. Historic Scotland property; 2 Bronze Age cairns, 1 Neolithic cairn (3000BC); axe carvings in N cairn. Temple Wood Stone Circles, Argyll and Bute – .25 miles SW of Nether Largie, South of Kilmartin, Argyll on A816. Open site. Historic Scotland property; circle of upright stones and remains of earlier circle; date approximately 3000BC. Machrie Moor Stone Circles, Ayrshire and Isle of Arran – 3 miles N of Blackwaterfoot, On W side of Arran, off the A841, 1.5 mile walk to the site. Historic Scotland property; remains of 5 Bronze Age stone circles considered one of most important sites of its kind in all of Britain. Twelve Apostles Neolithic Stone Circle, Dumfries and Galloway – Off the A76, N of Dumfries and New Bridge, Situated in a field. Of the 11 remaining stones only 5 are standing, the tallest of which is about 3.2 feet high. The Clava Cairns (also known as Balnuaran of Clava) lie 6 miles E of Inverness. These Bronze Age chambered cairns are each surrounded by a stone circle in a wooded field. A most unusual place. Robert Pollock has a guide to this site. Photos online by Phil Wright and Undiscovered Scotland. There is also Fingal’s Cave on the Isle of Staffa, Bowfiddle Rock on the Moray Firth, and the famous Ring of Brodgar on Orkney, among others. –> For a guide to nature and wildlife tourism in Scotland, see the end section of my post “Wildlife TV Programs This Week,” which also previewed the Destination Wild show Wild Scotland that aired on NatGeoWild on 2 April 2017. In the true final post of this series, the official Part 6 to An Outlander Tourist in Scotland, I present Scotland tourism tips and logistical resources, plus share some final thoughts on Outlander tourism in Scotland. Thanks for learning along with me. Slan leat!